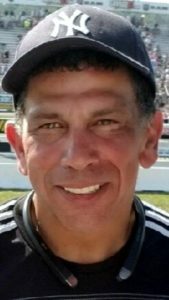 Johnny Lamboy, 53, of Lancaster, passed away peacefully on Monday, January 21, 2019 after a brief illness. Born in Bronx, NY he was the youngest of five sons to parents, Francisco and Clemencia (Mercado) Lamboy. Johnny was employed as a mail carrier for USPS in the City of Lancaster. He was an avid sports fan and involved himself in his children’s activities. He will be remembered as a good husband and father who worked hard to provide for his family. Johnny inspired his children with his handiness and automotive hobbies. He spent his time exercising and walking his unconditional companion, dog, Aggy. He is survived by his children: Leticia Charlene Lamboy and husband, Jay Cardenales, Johnny Lamboy Jr., Francisco Lamboy, Adina Rae Lamboy and husband, Tim Wieser, Isabella Elan Lamboy; grandchild: Elyana Jazlene Baez; girlfriend: Wanda Jimenez and Mother of his children: Ilsa Lamboy. He was preceded in death by four brothers. There will be a visitation on Saturday, January 26th from 3-5pm at Charles F. Snyder Funeral Home, 414 E. King Street, Lancaster. Burial will be private at the convenience of the family. I’m so sorry for your loss and he will be greatly missed. You all are in my heart. Johnny was an awesome man I was blessed to know fpr a short time. Hugs and love to the family. Sorry for your loss my dear family! Johnny, You are not suffering anymore cuz! You are at Peace! God’s kingdom has gained an angel! Love you forever until we meet again. Love y’all! MariaElena, Juny n the entire family! My condolences to the family may he RIP haven gained an Angel God bless the family.